House Plan: Port Royal Coastal Cottage SL1414 – Southern Living! 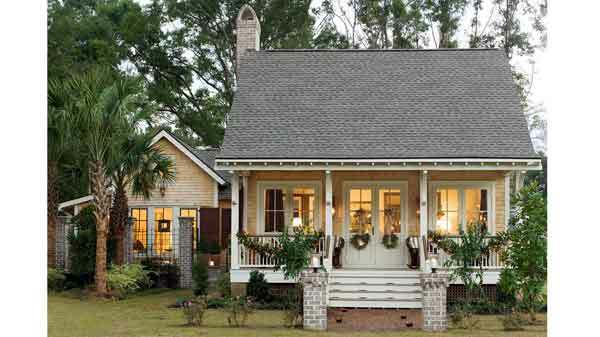 This is the Port Royal Coastal Cottage, a house plan from Southern Living. 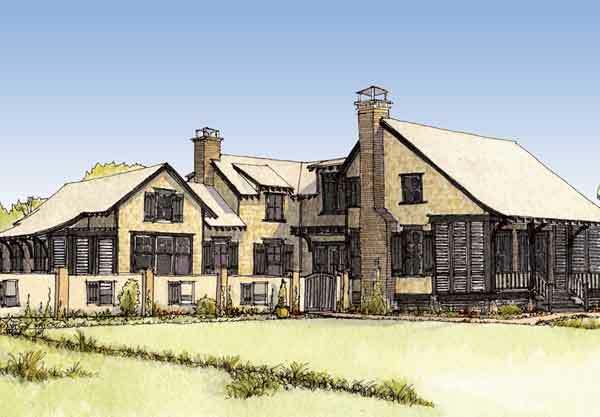 This is an exclusive design for Southern Living by Allison Ramsey Architects. They have the most amazing house plans I have ever seen, and this is no exception! They have a unique ability to make a new home look like something that could fit in an older well established neighborhood. Remember the detail that made homes in the “old days” so special? Well, Allison Ramsey Architects keeps that wonderful detail. This house is 2510 square feet with 3 bedroom and 2.5 bathrooms. If this plan looks like something you can’t live without you’re in luck! The contact info as well as pricing for the plans is listed HERE. Ok… my husband and I have been dreaming of building a small house. Now… after seeing this plan, I want this house plan, with a few modifications for us. This is an amazing layout. A wonderful porch to start out with, then the open dining and living room area which is also open to the kitchen so that the cook feels like part of what’s going on! From there wander to the back of the house and the laundry room with a nice washtub for bathing Fido, a small powder room tucked underneath the stairs, which is a brilliant use of space! From there wander to the library and reading room, both with fireplaces and finally on to the master bedroom/bathroom/closet. Whoa… we could easily live in a one story. Oooh! Idea! Maybe leave off the second floor and build a cool garage with a guest room above it! Do you see what I see? An outdoor shower? What a fabulous courtyard area. A nice small pool, terrace, fire pit, outdoor kitchen and a storage area. Pretty darn fabulous. Attached to the master bath is the outdoor shower. Pretty cool. Changes I would make for us personally… a smaller bathroom… we don’t need two sinks or even a bathtub… Just for cost efficiency I would probably not install a fireplace in the reading room/library. I love the way it looks, but I can’t imagine we would use it much and it would take up valuable wall space for PAINTINGS! We love our art and can you imagine having even more wall space? Woohoo! Nice upstairs plan, nice and simple but efficient. For us maybe a room for storage and one guest room. What about you? What are some changes you would make? Truly, I could happily take it just as it is… this is gorgeous! Side view… bigger than it looks from the front! Look at the side view. LOVE it in every single way! You can find this plan on AllisonRamsey.com as well… it’s called the HOLIDAY HOUSE. They have photos that you can see of the interior of a house that has already been built. AMAZING! T w o Y e a r s A g o: Artist to watch… Kyle Martin! T h r e e Y e a r s A g o: Have you met Mrs Meyers? Featured Artist… John Michael Carter! ART WALK TONIGHT! love this house plan – this is a keeper! me too! this is a BUILDER 😉 love, love, love! Cool! Thanks for the info Scott! Hey Barbara….thanks so much for the shout at! We love this house too…..you can check out some photo’s here – http://allisonramseyarchitects.smugmug.com/Carolina-Inspirations-Book-II/Holiday-House/11152149_zxFwx7#!i=781626473&k=dyKqz and if you want to test it out….the folks that own it have it for rent right now! Thanks so much! My husband found this house on your site last night… This is the most amazing plan I have run across. We can’t get it out of our minds! Perfect in every way! Hey to test it out is the best way! Thanks for the info! I just updated that post to include a link to your site for the Holiday House as well as a link to the images. To SEE it really helps! Gorgeous!